Dynamic Part Indexing is a patent-pending technology which we developed to solve many of the limitations of the freeform techniques (Slow Slide Servo, Fast Tool Servo or Diamond Micro Milling) in the machining of lens arrays or monolithic multi-cavity molds. DPI is a device that works as an add-on to an ultra-precision diamond turning lathe. DPI shifts the workpiece with respect to the main spindle in a dynamic, balanced and ultra precise way to sequentially align each surface of an array. With this technique, the form accuracy, surface finish and geometric freedom that is possible to make for a single on-axis lens; can be done in a complete array. Lenses may even be intersecting in a square or hexagonal manner, with extremely sharp edges for a 100% fill factor. COMPAS stands for compression molded polymer aspheres. It is an isothermal process in which a thermoplastic material (PC, PMMA, Zeonex, etc) is formed in a closed-cavity mold. Polymer preforms are inserted into the mold cavities, and isothermally heated above glass point. Novel tooling has been developed to produce high volumes of COMPAS optics at reasonable cost and cycle time, using large scale parallelization of mold cavities. 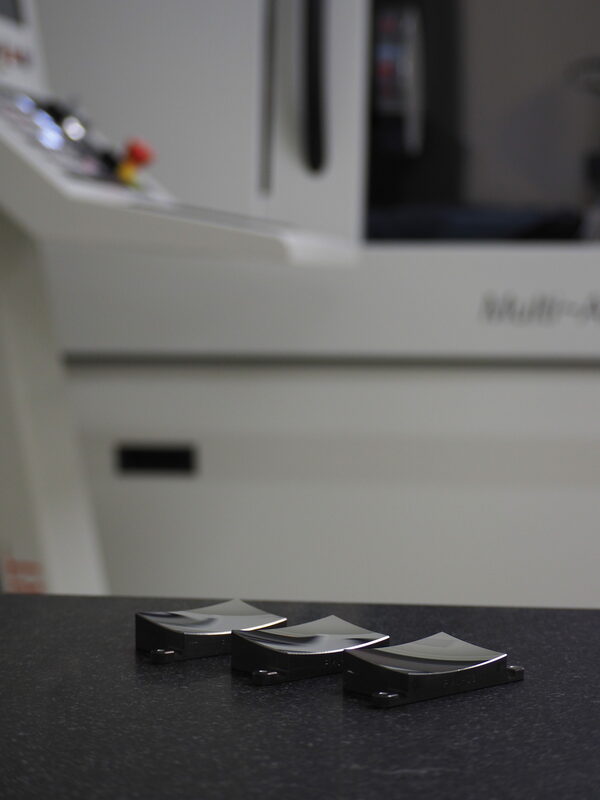 With the COMPAS method, ultra-precision lenses can be produced in an economically viable way and with increased accuracy compared to injection and injection-compression molding. The process is a two-step one comprising the injection molding of preforms and the compression forming of the preforms into the final lens shape. The preforms are loaded into a monolithic multi-cavity mold made using DPI. The mold halves with the preforms in place are heated above the glass transition temperature of the material and pressed together. As the thermoplastic flows, the two mold halves come into contact closing the lens cavities. This closed-cavity cycle is advantageous as it ensures better forming of small features (uniform pressure inside the cavity) and guarantees a high precision on the lens thickness. The mold halves are cooled down below the glass transition temperature and the thermoplastic material shrinks with respect to the mold, releasing itself from it. Once sufficiently cooled the mold halves are opened to extract the molded lenses. To provide a complete service to our customers, we have recently invested in a "world class" ultra precision diamond machine tool operating in a thermally stable and vibration free clean room environment. This machining equipment is accompanied by a variety of metrology instruments to guarantee the utmost quality of every part that we make.